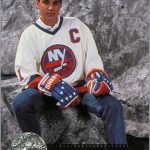 In 1991, the National Hockey League celebrated its 75th Anniversary. 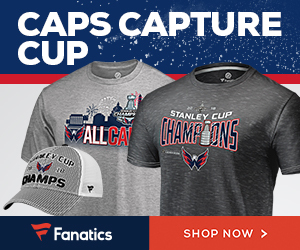 The Original Six teams wore throwback jerseys, harkening back to the 1920s. Another part of this celebration was that each of the 22 teams had its own “Celebrity Captain”. Some teams named former players as their Celebrity Captain – such as Terry O’ Reilly (Boston) and Maurice Richard (Montreal). Other teams chose instead to name a personality or actor as their captain. For the Chicago Blackhawks, Chicago-born actor and Second City alum James Belushi served as the team’s Celebrity Captain. 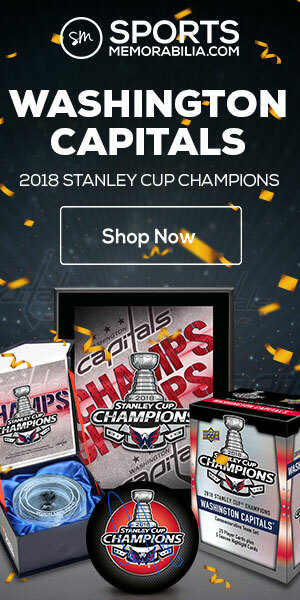 The now-defunct hockey card manufacturer Pro Set – for some reason – felt the need to issue cards for twelve of these captains. 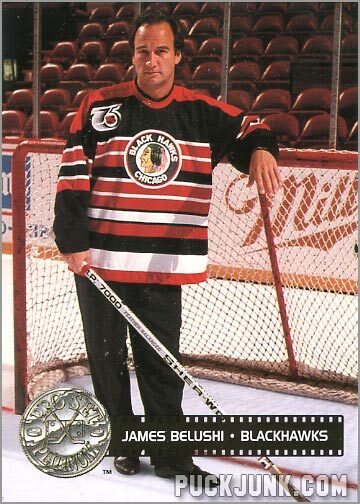 People who would not normally appear on a trading card – like Larry King (Capitals), Marv Albert (Rangers) and Belushi – were featured in part of the 1991-92 Pro Set Platinum Series 2 set. Star of film and television, James Belushi is Celebrity Captain of his hometown Chicago Blackhawks. Acclaimed early in his film career for his work in Oliver Stone’s political thriller Salvador (1986), Belushi has numerous film credits, including two scheduled 1992 releases: Once Upon a Crime and A Trace of Red. Familiar to television viewers as writer and performer on Saturday Night Live, Belushi was featured in episodes of Working Stiffs and Who’s Watching the Kids. For HBO’s Cinemax Comedy Experiment, he wrote, produced and starred in “Birthday Boy”. During the two years before the launch of his television and film career, Belushi was a resident member of Chicago’s highly regarded Second City improvisational comedy troupe. His 1986 screen breakthrough in About Last Night featured him in a role he originated in an award-winning Chicago Apollo Theater Center production. 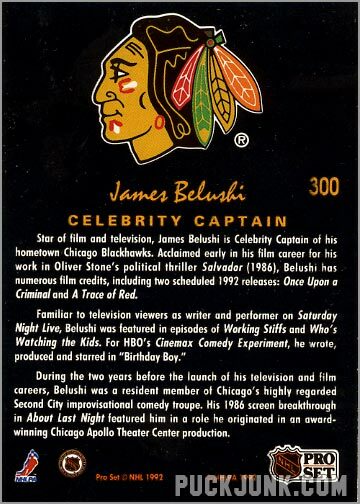 I always wondered why Belushi was Chicago’s Celebrity Captain, instead of Hall of Fame ‘Hawks Bobby Hull or Stan Mikita. Even Chicago-born actor George Wendt (Norm from Cheers) struck me as more of a hockey fan than Belushi. 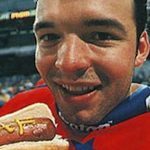 While hosting Saturday Night Live, Wendt tried to slip in a reference about Blackhawks coach Mike Keenan during one of the “Super Fans” (“Da Bears!”) skits, but the producers shot it down, saying that no one would get it. While Belushi has not exactly been an A-list celebrity, he has been actively employed as an actor throughout the years. 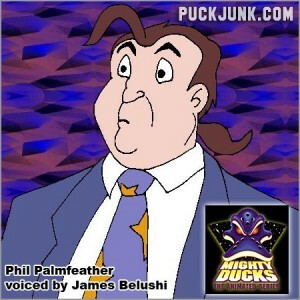 Interestingly, Belushi was the voice of Phil Palmfeather in the hockey-themed animation series The Mighty Ducks (1996-97). In the cartoon, Palmfeather was the human manager of a hockey team made up of anthropomorphic space alien hero ducks from the planet “Puckworld”. Belushi currently plays the lead character in the sitcom According to Jim. 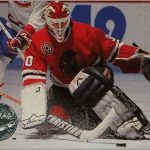 In fact, I randomly caught an episode of the show, where Jim was reading the sports page to his daughter (instead of a bedtime story) and mentioned the Blackhawks beating Calgary. 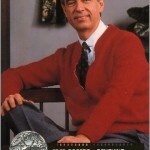 That triggered my long-suppressed memory of this card – but that’s a good thing. These “Celebrity Captain” cards are a goldmine of cheesiness, so expect to see more of them featured here soon.